Can you do something like this for lock picking if it doesn't exist already? has anyone used all 4 perks and gotten 6 total hack attempts? i do not receive the 6th attmept when choosing the hacker 4 perk. i think this is tied to a game setting or possibly just that it was only designed to have a max of 5 with the companion perk. if anyone has any info or insight into this it is appreciated. im looking into possibly making the last level drastically lower the amount of words that show. Ok, I've got a bizarre problem here. I've got some kind of conflict NOT caused by this mod, but which breaks this mod(some kind of conflict not associated with this mod), so I'm posting the issue here in case someone else has seen it and/or knows a solution. As a way of minimizing the number of plugins in my game, I manually merged this mod into a gameplay mod created with several other mods of similar function. To start with, everything worked fine (and worked well for several hundred hours of play). 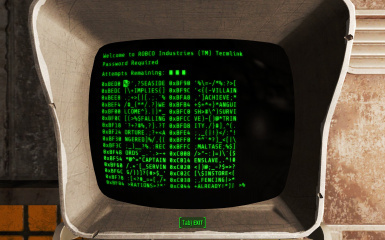 Recently I tried to hack a computer and was prompted "You need a higher hacking perk to hack this terminal", which I though was weird as it was a basic level terminal. I loaded up FO4 edit with an un-edited version of this mod and there are absolutely zero conflicts with the contents of this mod, so I'm sure everything was copied correctly. I've tried loading this mod (the original version, not my merged version) at the very end thinking it's possible I missed something in FO4Edit, but I'm still being prompted. I even added all the hacking and lockpicking perks both with the console and using perk points but, again, no change. Just as an update. I deleted all instances of the settings in this mod from my combined mod thinking there may be something I somehow missed when I merged it. Loaded the game without this mod installed and the minigame works as it's supposed to. Installed the plugin from this mod without tweaking anything and suddenly the minigame doesn't work again (asking for a higher perk agian). My only supposition is the recent update to 1.10.2 did something to break this mod. If anyone can tell me what needs to change to make this work, I'd really like to hear it. Currently I have my minimum words set to 10 and maximum to 25 (I did this through my startup .ini console commands instead of through a plugin) but that's the only change I've been able to carry over. I've had to add the perks via console to be able to hack all consoles (I refuse to waste valuable perk points on something so friggin pointless) but I would like to see the functions from this mod back in my game. Final update unless someone shows up with information that will help me figure this out. I loaded my secondary "Testing" savegame that's purely vanilla and it seems like this mod worked fine in there. It did exactly as it's supposed to so I guess my problem lay somewhere else, but I'll be damned if I can figure it out! I've loaded this mod directly on my modded save and it's still not working correctly so, considering it works on a Vanilla save, the problem is something else that affects hacking........SO! If anyone has any ideas as to where I should look for the conflict, please let me know. Could you please make something similar for lockpicking? That way we can try to lockpick at any level, but it becomes significantly easier as we take level-appropriate perks (a-la Skyrim). I was going to make the same request. I hate not being able to even try harder locks/terminals. Thirding this. Although you would want to make locks higher than your rank + 1 nigh impossible to pick. The game puts a fair amount of powerful gear behind master locks and terminals that might give too big of an advantage to low level characters. Can you hack into NASA's supercomputers and steal all their data, right now? My point concluded. Player Lockpicking. Does essentially the same thing as this mod. I had thought of making this very mod. Looks like you beat me to the punch! In any case, thank you! This out to make things more interesting. Have you considered a lockpicking version? I like this approach, but I feel like this may cause some issues in a few places were Bethesda depends on the Perk restrictions to grant your character access to level-appropriate gear. I can update those checks if you know of any. but it's all about player freedom, right? i mean that one guy on reddit walked outside Vault 111 in the wrong direction, ran into a Atom Cat T-60 Power Armor dude and stole the fusion core and armor from him... 45 minutes into the game! Hahaha, that's rich! Freedom indeed. I kinda wanted a mod like this which makes the hacking game harder(from the player's perspective), aspecially because my char has 10 int, and thus the minigames are not that hard. My issue is that "not forcing" the player to spend those points into hacking to be able to even try those difficulties give a major benefit for the player. I'm not sure if you take requests/suggestions but I would prefer a mod which would increase the hacking game's difficulty on its own, w/o removing the perk requirements, thus not artifically increase the player's perk points. You can do that in FO4Edit, load plugin and open perk records, check "Gate level" values. Copying them from master file should do the trick. I like where you are going with this mod. An added bonus would be to lockout the terminal any time you exit before completing the hack. This way you are actually risking something rather than playing a minigame you can quit if you are losing. So, you get one shot to do it. If you can do it in 3 then great. If you can't then you are going to have to wait awhile or hope Valentine can do it. I quite enjoy the idea of a challenging hacker mini game but it's totally pointless when you can duck out with one try remaining for absolutely no penalty. Holy crap I never even considered that before. Would love to see this addition!